Building a deck is hard work. There is often lots of digging. Concrete has to be mixed and hauled. Heavy treated lumber needs to be carried to the deck site. Anything that can be done to limit aggravation and mistakes will surely make the job go smoother. 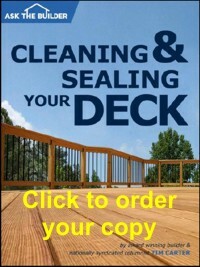 Here are 15 tips that I have learned from firsthand deck building experience. I hope they help you save time and money. Don't waste time trying to stake out the pier locations for your deck. You will make a mistake! Here is the easy way. Simply construct the outer frame only and suspend it in the air with temporary legs. This allows you to square up the frame perfectly. With the ledger board securely fastened to the house, the two joists and the outer band board can move sideways. If you have a perfect square or rectangle, squaring the frame is simple. Once the two diagonals measure the same distance, the frame is square. Nail a long 2x4 from the side joists to the ledger and band board to hold the frame in place. You can now drop plumb bobs from your corners to the ground. This allows you to position your piers perfectly. Using the right tools makes this a breeze. I use a post hole digger that has sharp cutting edges. Don't be afraid of filing these edges. Cutting roots becomes a snap. You will need a hand trowel too. Post or pier holes need to be wider at the bottom than the top. Most DIYrs do just the opposite. Frost can heave a tapered pier right out of the ground. When piers are wider at the bottom, the pier has to "lift" the surrounding frozen ground. That's tough to do. Use a round point shovel for general purpose digging. A square point spade is the way I square up trenches to look like architect's drawings! A duck bill shovel cuts deeply for trench digging too. An iron spud bar with a pointed end will crack pesky rocks. Don't waste time trying to figure out how to suspend steel rods in a form or trench before the pour. There is nothing wrong with filling the trench half way and then placing the steel on the concrete. As you add the remaining concrete, the steel is locked in place. That fancy suspension stuff is for the union rodbusters. They have the tools and materials to do this, not you! The board that is attached to your house is called a ledger board. It needs to be through-bolted to your house. Lag bolts can pull out over time. Plus, an aggressive helper can easily strip the threads in the wood by overtightening. Be sure to stagger the holes for the ledger board AND make sure they are not in the way of your deck joists. You need to locate your interior joist bays if the house joists are running in the same direction as the deck joists. Ideally, you want your deck joists to be in the same line as the interior joists - assuming the interior joists are 16 inches on center. The point is simple - you want to make sure the through bolts do not get in the way of a deck joist or a joist hanger. The time spent laying this out will pay for itself. Be patient with this process! Did you know that you can't use roofing nails for joist hangers? Many DIYrs do. Roofing nails are not "structural" nails. The heads pop off easily when loaded and the shafts are too thin. Many joist hanger manufacturers make special hot dipped structural joist hanger nails. They are a must. There is nothing worse than removing nails after the building inspector turns you down. If your deck is up in the air - that is, anything over eight feet - you need to install diagonal braces from the beam that supports the joists and the posts that run to the ground. If you get lots of dancing people up on the deck, it can actually rack sideways and collapse if these bolted supports are not in place. Long 2x4's nailed in an X pattern to the underside of the floor joists will also help stiffen the deck against racking. 4x4's Don't Get it as Posts For Me! How are you going to support the beam on the posts out at the end of the deck? Are you going to nail them to the posts? No Way! Drill holes and install through bolts? That is better. The best way is to use 6x6 posts. You can then cut a ledge into the 6x6 for the beam to rest upon. The remaining portion of the 6x6 still extends to the top of the beam. This allows you to through-bolt the beam to the post. You can set the beam on top of the post as long as you use special structural connectors made for this purpose. If your house has wood siding it might be a very good idea to install a flashing that laps over the ledger board and extends up behind the siding. This prevents water from getting behind the ledger board. This water can leak through the bolt holes and rot the siding and structural framing of the house. When you nail your final decking board up against the house, do not nail through the flashing! Just nail into the deck joists that project out from the ledger board. If you end up with a small strip, then install the strip as your second last decking board using a full sized piece against the house. If you are building a deck that is close to the ground - the bottom of the joists are 18 inches or less from the soil - then you should really seal the floor decking boards on all sides before they are installed. This will slow or minimize water vapor absorption on the underside of the lumber over time. This absorption coupled with the drying effect of the sun and wind on the top side of the deck is the leading cause of cupping. Decking that is cupped is simply unsightly. It also traps water and ice on the decking boards. This is dangerous and leads to accelerated deterioration. Keep the Outer Band Board Straight! Once you start to install floor joists in your frame, it is easy to bow the band board. You can keep it straight with a string. The trick is to stretch a string tightly on the outside of the band board from corner to corner. Now install a small 1/2 or 3/4 inch block of wood under the string at each corner. As long as you maintain the outer surface of the band board the same distance from the string as you add joists, it will remain straight. I always like to install the middle joist first to get the center of the band board perfectly in line with the corners. I then split the newly created half sections with a joist. Once you do this, you can fill in the remainder however you like. I used to think my shiny galvanized decking nails were the best. Wrong! They usually begin to rust within two years. Use either stainless steel nails or decking screws. At the very least, use hot dipped galvanized decking nails. Be sure you drill the nail holes at the ends of decking boards. Nailing that close without pilot holes will crack the decking. If you are using pressure treated lumber for your decking, do not space it. A 3.5 inch wide piece of decking can shrink as much as 1/8 inch - sometimes 3/16 inch! Redwood is more dimensionally stable. You can space it with a 16 penny nail or lath strips. Some cedar decking will shrink. Ask your lumber supplier if the cedar is kiln or air dried. Air dried cedar will shrink. Don't space air dried cedar! Railing posts must be very secure. They absolutely must be bolted in two locations along side deck joists. Sometimes deck posts can extend continuously above the beam to become a railing post. I will often cut down the 6x6 post to a 4x4 above the beam for this specific purpose. Stair building is an art. It requires lots of thought and layout. A beautiful deck can be blemished by a poorly constructed stair or one that is not balanced. I feel the most comfortable steps are those with 10 inch treads and 7.5 inch risers. This means that you need to plan your landings and deck heights. Multi-level decks must be built at some multiple of 7.5 inches from one another. Landing areas from driveways or sidewalks need to be this same multiple if at all possible from the finished surface of the decking. Don't make the mistake of measuring straight down from the deck for your stairs! You need to measure from where the stairs will end out from the deck. Get an approximate height measurement and figure out how many treads you will have. Multiply this by 10 inches. Measure out your calculated distance and then see the difference from this point to the top of the deck. Plans - What Plans? - Did Someone Say Plans...? I saved this one for last. I want you to remember this one! Be sure your deck plan is superb. Make scale cutouts of your furniture, grill, table, etc. Be sure the cutouts fit on the plan and you still have room to move around. Nothing could be worse than building a deck that is too small. Look at your living, dining or family room for help. See how the table works in the dining room? See how much room you need for chairs sliding in and out? If it doesn't work on paper, it will never work in reality - unless you shrink the furniture!